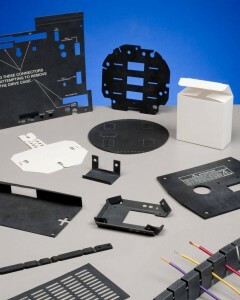 Die cut Formex materials can be fabricated into internal mechanical components such as air flow baffles and wire harness organizers, and used in place of more expensive plastic injection molded or metal parts. Because they won’t readily crack or split, die cut Formex parts can be shipped flat to save freight costs. Die cut Formex parts also support lamination with metal foils for EMI/RFI shielding. Does your application require flame-retardant, electrically-insulative parts? Would you like to learn more about how die cut Formex parts can help reduce shipping costs and support final assembly? To learn how Interstate Specialty Products’ die cutting capabilities can support your application, contact us on-line or call (800) 984-1811.